When I wrote this account of the September 4th earthquake last year, I never expected to be writing one again less than six months later, about a much more devastating earthquake in the same city. I was in the central city at the time, and due to have a meeting with Lucy from Felt at 1pm. At around 12:50pm, I was rounding the corner of Bedford Row, and walking towards her office, a lovely old two storey red-brick building. As I got nearer, Mel was just leaving the building. She saw me coming, and went back to unlock the door for me. Before I got close enough to say hello to her, everything started to shake. 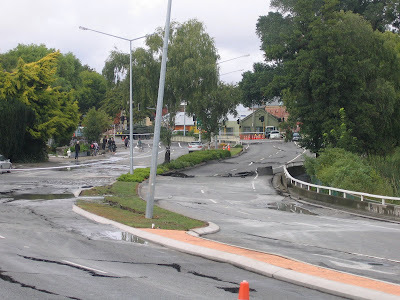 Thinking it was just another aftershock, we quickly moved away from the building into the middle of the road. It soon became obvious this was not just another aftershock. 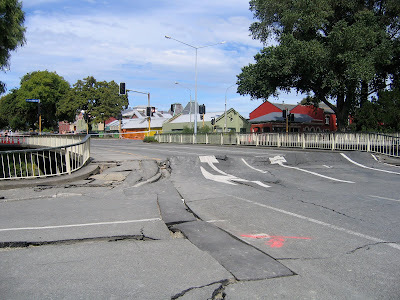 The buildings around us began to shake violently, and the road was moving from side to side. Bricks started falling off buildings. Then, with horror, I watched as the top-storey of a building which had been red-stickered from the first earthquake collapsed back onto itself. 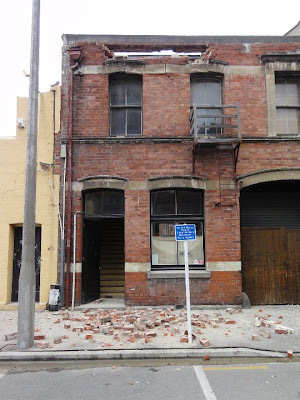 This building was next door to the one that Lucy was in, which was also beginning to crumble. Bricks were falling off, and a lot of dust was coming out of the building. Eventually the shaking stopped, about ten very destructive seconds after it started. We were very concerned for Lucy at this point. The building was still standing, but had lost a few bricks. She appeared at the door less than a minute later, surrounded by a cloud of dust. I have to say, I have never been more pleased in my life to see someone walk out of a building! People soon poured out onto the street from neighbouring buildings, and nearby acquaintances of Mel and Lucy came by to check they were ok. I looked around to survey the damage, and noticed most of the older brick buildings around me had lost at least part of their walls. Then I looked up and saw the top of the Hotel Grand Chancellor. A couple of the windows near the top were out of line, which clearly wasn’t right. At that point I realised how serious this was. I texted Josh to check he was ok, and got a reply about ten minutes later to say he was, which was a great relief. I was tossing up whether it was worth going to retrieve my car from the parking building I had left it in. I wasn’t real keen to go and get it, and my nerves were far too frayed to drive safely anyway. Then a policeman came by and told us to leave the area, away from the CBD, so I figured walking was a good option. He had also mentioned that there had been fatalities. We had concluded this was likely, but it's not good to have those suspicions confirmed. When we got to the end of Bedford Row, there was a lot of smoke and dust to the left of us further up Madras Street, where we were headed. Some builders standing at the corner told us not to go that way, as there was a lot of carnage. I took a very quick glance, and saw the CTV building. All I remember was that the sign was on the ground, and it didn’t look right. I quickly looked away, as I couldn’t take any more in. On the walk home, we walked past a car that had the radio on. It was reporting that the earthquake was 6.6, and only centred 1km deep near Lyttelton. I had figured it wasn’t as high on the Richter scale as the first one, as it hadn’t lasted so long. However I had assumed it must have been centred right under the CBD as it was so violent. It later turned out to be 6.3, and 5km deep. I also thought I heard someone say that the bus exchange had collapsed in the middle, so began to wonder about the state of my car, which was parked in the Crossing carpark. I haven’t heard any similar reports since, so am now hoping my car is safe and sound, and now believe they may have been talking about the bus depot. I imagine it could be weeks before it is safe to go back and retrieve it. The last part of my journey home proved interesting. The bridge on Fitzgerald Ave was closed to traffic due to damage. It was still walkable though, so I ran across the bridge, and then gingerly stepped over the newly formed step at the other end. It was quite an obstacle course to navigate the next part of the road that hugs the river, the road was cracked and had lots of humps and hollows. I wasn’t sure what to expect when I got home. 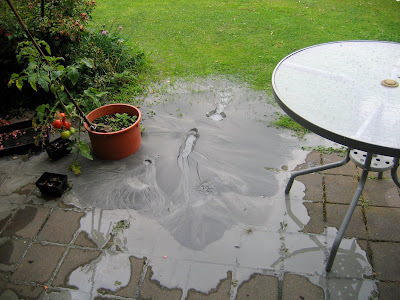 There was a bit of liquefaction in our street, when there wasn’t any at all last time. Our house looked fine from the outside, which was a good start. It was a complete mess inside, much worse than last time. Glasses had fallen out of the cupboard and smashed all over the kitchen, and the fishtank had smashed and spilled water all over the carpet. 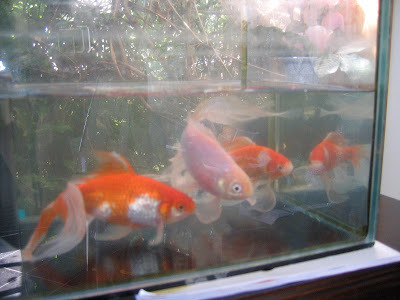 It was sad to see the fish lying on the floor, and I wondered if I should find a container of water to put them in, just so I could feel like I had tried to give them a shot at life. Then one of them wiggled, so I raced around trying to find a suitable container, and some water to put in it. I ended up scooping it out of the toilet cistern. I picked up the two fish I could see and put them in the water. They both wiggled, so still had some signs of life left. I looked around for the other two, and found one under the ottoman. It didn’t move when I picked it up, and after leaving it in the water for five minutes, took it back out, as it was clear it was too late for this one. 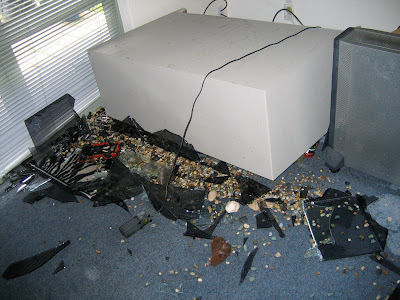 I looked around for the other one, but couldn’t see it anywhere, and wasn’t keen to start picking up the cabinet to look for it, with all the broken glass on the floor, and continuing aftershocks. Still, I thought it was a good effort that two had survived after being out of water for an hour. I started to clean up the broken glass off the floor, and began to field calls and texts from concerned family and friends. I knew I could switch on the radio to find out what was happening, but still couldn’t take any more in at this stage. It was hard enough to comprehend what I had experienced. After Josh came home, he started cleaning up the mess in an effort to locate the other fish. It still wasn’t anywhere to be seen, so we took another look, and I saw it under the couch. Josh got it out, and, after nearly three hours, it was still moving! So we now still have three out of the four fish which I think is pretty impressive. We finally switched the radio on at about 5pm, and I learned why I had so quickly looked away from the CTV building. 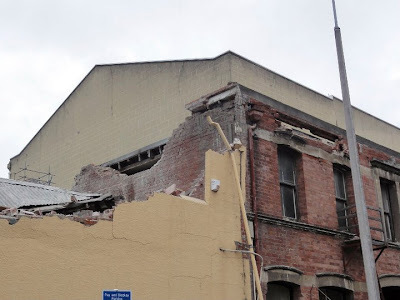 It had collapsed, along with another, the PGC building. The numbers feared dead were in the hundreds, and it was clear this was a day I will never forget. We stayed at our house the first night. I had considered sleeping downstairs in the lounge, but with the carpet sodden from the fishtank, the upstairs options was still slightly more appealing. The next day when we still had no power or water, we decided to take up the offer from Josh's parents to go and stay at their house in Waikari for the next few days. Events like this highlight what is truly important in life. The only thing that really matters is people, everything else are just nice little extras. Every time that afternoon I saw a familiar face, a tiny piece of order returned. This wasn't the end, and we can get through it. It has been really humbling to hear from all the people who were thinking about me, and wanted to know that I and my family were safe. The messages came from all over the world, from former colleagues from London, to friends, family and blog/facebook/twitter followers all over the country. It means a lot to know you are all thinking of me, and I would like to express a heartfelt thank you to everyone who has thought of us. My heart goes out to all of those people who have lost or are missing family or friends, it has been a terrible time for this city. I had planned to write a blog post on Tuesday summing up what I had achieved over the last year, as it was a year to the day that I lost my job. I never in my wildest dreams imagined how the day would unfold. Kia Kaha. Christchurch will get through this, and be stronger than ever before. A truly surreal experience for you. 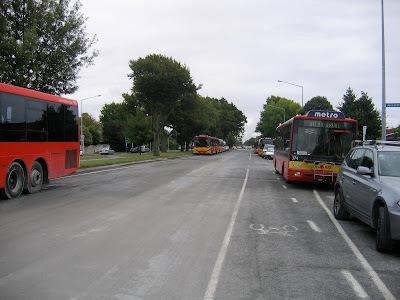 I can only imagine what it must have been like, and what life must be like in Christchurch for many people now. My heart goes out to you all. So glad you have the strength to write such a detailed account. At this stage I am still feeling so lost for words but I am not rushing it. Everyone gets through things in different ways. Its heart warming to hear from you Rose. Thanks for this post. Wow. I can't even begin to imagine what it must have been like.Thank you for sharing your experiences. I'm so glad you and yours were unharmed, even 3 of the fish, they must be tough! Rose... Unbelievable!! It's almost impossible to imagine even though we've been viewing television footage and newspaper images of the earthquake and its aftermath every day since. Bobbie – A lot of people have described it as surreal, but to me it was totally real, nothing surreal about it. Now, however it doesn't seem real. Julia – It took a few days before I could start writing in, and then I got to a point where I had to write it down to stop it running round in my head. On a lighter note, the TV upstairs was thrown 1.2 metres to the ground again, and still works. Samsung makes strong tvs! Thank you for sharing your story Rose. It makes it even more real for the rest of us watching with concern from afar.